By now, everyone should have a pretty good idea of what they're getting into when they stick a "SyFy Channel" movie into the DVD player. The bad ones are beyond awful, and even the relatively good ones are hamstrung by low budgets and subpar SPFX. I'd put STONEHENGE APOCALYPSE (2010) in the latter category, since I pretty much enjoyed it when I wasn't wincing at some of its shortcomings. One of these is the fact that Stonehenge itself looks a little off from the very first shot. This is because only 60% of it was actually built full-size on the Vancouver location while the rest was filled in with bad CGI. I did like the early scene showing a group of tourists and their guide being disintegrated when Stonehenge suddenly comes to electrical life, rearranges itself, and starts emitting deadly energy rays. This is due to the discovery of an ancient underground chamber in Maine where archeologists, led by Dr. Joseph Lesham (Hill Harper), somehow manage to power up the energy grid which crisscrosses the globe at various key points. Which include, in addition to Stonehenge, many of the world's largest pyramids. A scientific task force leaps into action, led by Dr. John Trousdale (Peter Wingfield) and Dr. Kaycee Leeds (Torri Higginson). While they're busy getting nowhere, crackpot brainiac Jacob Glaser (Misha Collins) detects the power surge during his radio call-in show--where he espouses his widely-derided scientific beliefs and conspiracy theories--and hops the next plane to England. It's a sure bet right off the bat that (a) Jacob will cut through the bull and pinpoint the problems baffling the more rigid-thinking scientists, and (b) they'll initially regard him as crazy and rebuff his every word until one of them finally realizes that he's right about everything and risks his or her reputation to help him. Director Paul Ziller does what he can to sell the resulting devastation with the limited resources available. For a global apocalypse it's a pretty low-key affair and we're asked to use our imagination a lot. In place of actually seeing all the catastrophic destruction taking place offscreen, we get lines like "Omigod, Indonesia has been flattened" and "Omigod, the Mediterrean Sea is flooding into Egypt." This is augmented by lots of newsreader voiceovers and stock footage to take our minds off the fact that much of the film's action consists of people in rooms describing what's going on. 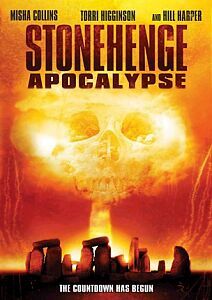 Things begin to pick up when Glaser figures out that the key to stopping Stonehenge from realizing its mysterious goal is an ancient artifact housed in an American museum. Dr. Leeds springs him from military custody and they rush to recover the item, but are met by gun-wielding fanatics who have foreseen the coming apocaplypse and fancy themselves its chosen survivors. With a SWAT team as backup, they find themselves in the middle of some passable gun battles along with a dicey SPFX sequence of a gaping fissure opening up and threatening to swallow them as their vans try to outrun it. More action takes place within a pyramid which has suddenly erupted from the earth, in which the fanatics plan to take refuge while the rest of humanity is wiped out. As with the rest of the film, production design here is simple and low-rent. I wouldn't really call any of it "bad", though--it's just a case of filmmakers making the best of what they have without the benefit of a Daddy Warbucks budget. In fact, I admire Ziller and company for huffing and puffing to make this small project as good as it is. With time running out, everyone converges on Stonehenge once again, with scientists, military, and fanatics all working at cross purposes. A fair amount of suspense is generated as Glaser, armed with the ancient key, races to deactivate the stone device while a fighter jet is en route to nuke the entire area as a last resort (resulting in some of the film's more impressive CGI shots). The robust musical score by Michael Neilson really helps heighten the tension here--in fact, listening to the furious end credits music is almost as exciting as watching the movie itself. Misha Collins ("Supernatural", "24"), who kind of resembles the late singer Robert Palmer, makes for an okay hero with an amusing running gag involving a robot head. "Stargate: Atlantis" alum Torri Higginson does her best but, like several of her fellow castmembers, struggles in vain with a hopelessly phony-sounding British accent. (Sprinkling the dialogue with terms like "bloody" and "mate" doesn't help.) Welsh actor Peter Wingfield as Dr. Trousdale and Michael Kopsa as General Forsha, who orders the nuclear strike, acquit themselves well, while Hill Harper as Leshem does what he can with a rather silly character. The DVD from Anchor Bay is in 1.78:1 anamorphic widescreen and Dolby Digital 5.1 sound, with English and Spanish subtitles. Extras consist of a trailer and a pleasant half-hour "Behind the Scenes" featurette with cast and crew interviews and production footage. It's no newsflash when a SyFy Channel movie turns out to be less than stellar, which makes something as blandly diverting as STONEHENGE APOCALYPSE come off even better than you might expect. If anything--as one of the cast points out in the featurette--it's a great instructional video for what to do in case the events depicted in the film should actually occur.